Atencio Takes Exception to White Recruiting His Fighters – Some might have missed it, however Affliction Entertainment’s VP Tom Atencio certainly didn’t. During a commercial break in this past Saturday’s “TUF 9 Finale,” UFC president Dana White publicly stated that he is intending to make a run at former UFC champ Vitor Belfort. 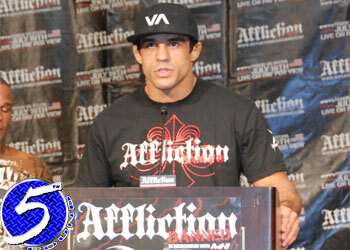 The only problem is he’s still under contract with Affliction with a fight right around the corner. Although Atencio was gracious as always throughout the interview, you did get a sense that he may have been a tad irked by the fact that White was trying to dip into Affliction’s talent pool. The conversation even swayed towards other major sports, where if an owner openly discusses wanting a player under contract with an opposing team, that owner could be fined for tampering. Oddly, White may have jumped the gun in announcing his pursuit of Belfort’s services. Although the Brazilian has won his previous four scraps, the last two coming under Affliction’s banner, what if he were to lose his “Affliction: Trilogy” bout against Jorge Santiago? Would White and Co. show the same desire for a 32-year-old fighter that just dropped his last fight? Interesting maneuver by White. We’ll just have to wait and see how this plays out.